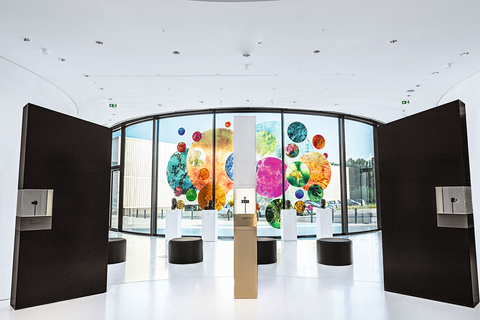 Alfons Alt, the art photographer who lives in France, has designed and constructed a work of art in glass especially for the Leica headquarters in the Leitz Part in Wetzlar. The installation across the three-part window on the northern side of the foyer is a particularly eye-catching work and is a fascinating enrichment to the world of Leica experience. For his piece entitled Kreiswerk (‘circle factory’), the artist, Alfons Alt, found inspiration in the geometry of objects and Charlie Chaplin’s classic movie Modern Times. As in the most famous scene of the film, his triptych also depicts an interrelationship of circular elements in light and easy form. Alfons Alt employs the energies of simultaneously appearing colours to instill his work with the motion of Chaplin’s cinematic masterpiece – and with this, sets his interplanetary glass bead game in oscillation. His aim – to expand the medium of photography by the addition of matter and open it to ‘the warmth of painting’ (Alfons Alt) – was achieved by the artist in years of experimentation and almost alchemistically complex processes. Alfons Alt worked with the Leica S medium-format system during the creation of his piece for the Leitz Park. His Kreiswerk can be viewed free of charge during the opening hours of the world of Leica experience. In the world of Leica experience, visitors can discover everything about the past and present of the company and the fascinating process of manufacturing optical products made in Germany. Alongside the milestones in the history of Leica products, constantly changing exhibitions present rare exhibits and collectors’ pieces from the history of the company. A permanent exhibition of Leica Sport Optics products is also on show: 17 pairs of binoculars from various decades provide an overview of the past 100 years of development in the design and construction of binoculars at Leica. The production areas offer public viewing and are located immediately adjacent to the product and exhibition areas. Three panoramic windows allow visitors to see what goes on in the clean rooms of Leica manufacturing, where lens elements, complete lenses and cameras are made. Individual windows are equipped with interactive touchscreens to provide more information about the processes. Like with a smartphone, visitors can tap on and swipe over the screens to access films, photos and explanations. A particular highlight of the world of Leica experience is the Leica Galerie, which plays host to regularly changing exhibitions of photography. On the occasion of the 60th birthday of the legendary Leica M rangefinder system the Leica Galerie Wetzlar shows two exhibitions: Magic Moments – 60 Jahre Leica M (‘60 years of the Leica M’) is a selection of top-class photos from the last six decades captured by various Leica photographers. The second exhibition is a project entitled 100 Fotografen – 100 Porträts (‘100 photographers – 100 portraits’), in which the American photographer Claire Yaffa reveals the personalities behind the camera in a series of tenderly composed black-and-white portraits. Both exhibitions will be open until 4 January 2015. In addition, a unique photo installation, entitled 36 aus 100 (‘36 from 100’) is a further component of the cultural experience. This photographic project shows a total of 36 iconic examples of Leica photography from the past 100 years, each of which played a role in the creation of the Leica legend. The Leica Store area of the complex, which also has its own integrated photo studio, is open from 10 a.m to 6 p.m. Monday to Friday and 10 a.m. to 4 p.m. on Saturdays and offers visitors an opportunity to find out more about all the latest Leica products and purchase them during their visit. Rest and refreshments are also on hand n the Leitz Park: a day at the Leitz Park can be rounded off in comfort and style with a visit to the restaurant or the coffee house, which has its own patisserie. The coffee house is open Monday to Friday from 9 a.m. to 6 p.m. and on Saturdays from 10 a.m. to 5 p.m (a breakfast selection is available from 10 a.m. to 1 p.m.). The world of Leica experience in the Leitz Park is open from Monday to Friday between 10 a.m. and 8 p.m. and on Saturdays from 10 a.m. to 6 p.m. Admission is free. Born in Illertissen in Bavaria in 1962, Alfons Alt has lived in France since 1985. In 1993, he made his home in Marseilles and founded an experimental workshop for alternative photography in the disused Friche Belle de Mai tobacco factory. Since 1988, the career of Alfons Alt has been documented by numerous exhibitions of his work in France, Spain, Germany, Portugal, Egypt and Belgium, some of which were accompanied by publications. His works can be found around the world in public galleries and private collections. The winner of the European Publishers Award for Photography has been connected with Leica in a partnership since 2001. For example, in 2012, his exhibition entitled Album in the Leica Galerie Salzburg attracted considerable attention.